What Can You Do With Sun-dried Tomatoes? 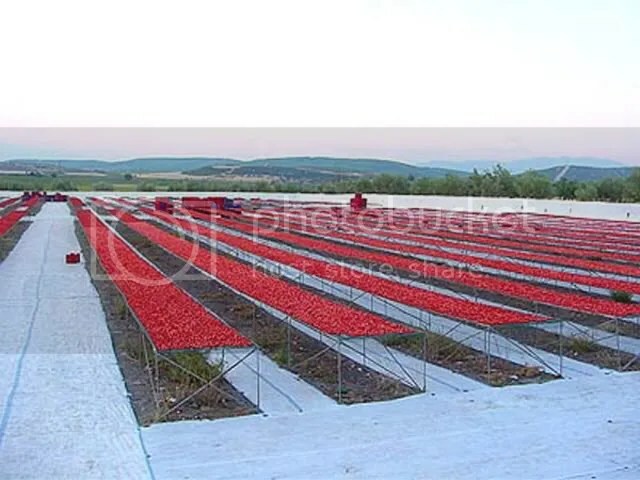 Sun-dried tomatoes are ripe tomatoes that are placed in the sun to remove most of the water content from the tomatoes. Cherry types of tomatoes will lose 88% of their initial (fresh) weight, while larger tomatoes can lose up to 93% during the process. As a result, it takes anywhere from 17 to 20 lbs of fresh tomatoes to make a single pound of sun-dried tomatoes. Even after the procedure, the tomato fruits keep their nutritional value. The tomatoes are high in lycopene, antioxidants, and vitamin C, and low in sodium, fat, and calories. Before modern canning methods were available, Italians dried tomatoes on their tile roofs for use in winter when fresh tomatoes were not an option. Nowadays, sun-dried tomatoes (pomodori secchiin Italian) are not as popular in Italy as they are in America, where they are mostly relegated to antipasto or as a flavor-booster for sauce. These dried, concentrated and flavorful tomatoes have enjoyed a popularity boost in the United States in the past couple of decades, initially as a gourmet item but fast becoming a favorite of home cooks. Sun-dried tomatoes can be used in a wide variety of recipes and come in a variety of shapes and colors. Traditionally, they were made from dried red plum tomatoes, but they can be purchased in yellow varieties as well. Sun-dried tomatoes may also be preserved in olive oil, along with other ingredients such as rosemary, basil, dried paprika, and garlic. Unless they are already packed in oil, sun-dried tomatoes will need to be reconstituted before use. Just let them soak in warm water for thirty minutes until soft and pliable, drain (reserve the liquid to add flavor to stocks and sauces), pat dry and use as directed in your recipe. You can also use wine, broth, or other cooking liquid to reconstitute. Once reconstituted, use them within several days or pack in olive oil and store in the refrigerator for up to two weeks. To reconstitute in oil, simply cover the dried tomatoes with oil and refrigerate for 24 hours. To use oil-packed, drain tomatoes from oil and use. Always be sure that those left in the jar are completely covered with oil, which may mean adding more oil as you use the tomatoes. Don’t toss out that oil when you’re done with the tomatoes. It will pick up flavor from the tomatoes and be great in salad dressings or used for sauteing. The flavor of sun-dried tomatoes is quite intense, concentrated, and slightly salty, so a little goes a long way. Although they are wonderful with pasta, you’ll enjoy using sun-dried tomatoes with many other foods, including vegetables, meats, and breads. Unopened commercially dried tomatoes will be fine without refrigeration for six to nine months. Once opened, oil-packed dried tomatoes should be refrigerated and used within two weeks. They can also be frozen. To use it as a pesto sauce and/or to add it to a pasta dish, omit the vinegar, thin it down with pasta water, and add pine nuts, sautéed zucchini, and chopped fresh basil. Place all the ingredients but the olive oil into the bowl of a food processor (or a blender) fitted with a metal blade, and purée to a thick paste. Continuing to run the machine, add the oil slowly through the feed tube or the lid of the blender. Taste for salt. 1. In a small mixing bowl, combine the cream cheese, sun-dried tomatoes and basil. 3. Cut the wraps in half on the diagonal and serve. 4 servings. Put oil in a large, oven proof skillet over medium heat and add thyme, garlic, tomatoes and capers. Cook just until mixture sizzles, then add stock or wine; raise heat and bring to a boil. Cook for about a minute, then add shrimp, turning them in sauce. Cook just until they turn pink. Sprinkle with salt and pepper, garnish with basil, and serve hot or warm with Italian bread. Pre-heat oven to 450 degrees F. Oil a baking dish just large enough to fit the pork tenderloin. Make the stuffing. Put the oil, sage, prosciutto and sun-dried tomatoes in a food processor. Pulse this mixture a few times until it is combined to a thick paste. Cut a slit through the middle of your pork, but don’t go through to the bottom and with your hands, spread the stuffing onto the center of the meat. Close the pocket. Tie together with kitchen twine to secure. Rub the tenderloin with olive oil, kosher salt and pepper. Place meat in prepared baking dish. Roast the pork at 450 degrees F. for 15 minutes, then turn the oven down to 350 degrees F. and cook another 30 minutes. Pork should be 160 degrees when done. Let the meat rest for 5 minutes so the juices can distribute evenly before slicing. Remove the string. To make a simple pan sauce, use the drippings in the pan and whisk in a tablespoon of honey mustard. There won’t be a lot of sauce, but enough to drizzle over the pork slices. Bring a large pot of salted water to a boil; add pasta and cook until al dente according to package directions. Reserve a cup of the pasta cooking water and drain pasta thoroughly. Meanwhile, in a large sauté pan over high heat, heat olive oil. Add garlic and cook until fragrant but not browned, about 1 minute. Add half the broccoli rabe and sauté until lightly wilted but not brown, about 2 minutes. Add remaining broccoli rabe to pan and cook for another minute or two. Add sun-dried tomatoes and cannellini beans and toss lightly. Taste and adjust seasoning with salt and pepper. Add hot drained pasta to the pan (or to a larger bowl if needed) and toss with the vegetables. Stir and add a few tablespoons of reserved pasta cooking water if mixture seems dry. Season and taste again. Serve immediately with freshly grated Parmesan cheese. Fish fillets may also be substituted in place of chicken. Serve with sautéed fresh spinach. Cook orzo in a large saucepan of boiling water until just tender, 8 to 10 minutes or according to package directions. Drain. Meanwhile, place water, 1/2 cup sun-dried tomatoes, garlic, 2 teaspoons marjoram, vinegar and sun-dried tomato oil in a blender. Blend until just a few chunks remain. Season chicken with salt and pepper on both sides. Heat 1 tablespoon olive oil in a large skillet over medium-high heat. Add the chicken and cook, adjusting the heat as necessary to prevent burning, until golden outside and no longer pink in the middle, 3 to 5 minutes per side. Transfer to a plate; tent with foil to keep warm. Pour the tomato sauce into the pan and bring to a boil. Measure out 1/2 cup sauce to a small bowl. Add the remaining sun-dried tomatoes to the pan along with the orzo, artichoke hearts and 6 tablespoons cheese. Cook, stirring, until heated through, 1 to 2 minutes. Divide among 4 plates. Slice the chicken. Top each portion of orzo with sliced chicken, 2 tablespoons of the reserved tomato sauce and a sprinkling of the remaining cheese and marjoram. Great article Jovina on sun-dried tomatoes. I have a Chicken Sausage Pesto Orecchiette. The recipe you offer for breakfast looks delectable. I am going to give this one a try. I am always looking for new ideas for breakfast. Thank you – it is a very tasty dish. I like sundried tomato pesto and on Monday I am posting about different pesto sauces. I would love to try your pasta dish. I look forward to the post on Pesto sauces. I usually make the basic, though I have substituted the pine nuts for pecans. I also have a recipe using cilantro(haven’t tried it yet) and another blogger uses several fresh herbs together to make a pesto. I guess the pesto you want to use depends on the recipe and flavor you desire. There are so many ways to make pesto. I have several that you mention, except for the cilantro. I really like them over grilled chicken and fish. Beautifully done and very thorough! thank you! Wow! I love this post. Sun dried tomatoes are awesome and your recipes are heavenly. Thanks for the sundried tomato write-up and the recipes. I love to use them in pasta.